A good NC fishing report can mean the difference between a great fishing trip and a weekend where you are doing nothing more than soaking your hooks. Stay in the know with our North Carolina fishing reports and you just might be shopping for a bigger cooler soon. Offshore Fishing Reports - Get the latest on all the activity off the North Carolina coast including reports from Big Rock, Frying Pan Shoals and off Cape Hatteras. 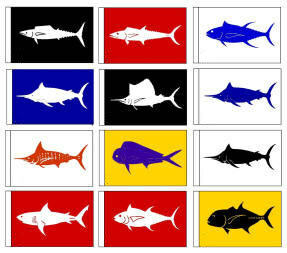 Inshore Fishing Reports - Inshore fishing reports to help you find the fish in the skinny water. Surf Fishing Reports - Up to date fishing reports for those who prefer to keep thier feet in the sand. Surf fishing reports for the entire NC coast. NC Pier Fishing Reports - Reports from just about every pier along the North Carolina coast. Catherine Willis' long-standing record set in 1972 for a 60 pound striped bass has finally been broken. David Hiebert of Kalamazoo, Michigan was fishing just off Avon on Hatteras Island on December 30th when he landed a 62 pound striper. The record striper measured 53 1/2 inches in length and 32 inches in girth. While Hiebert was elated about catching a North Carolina record, he missed out being able to cash in on his catch. On the day he landed his striper there was a tournament out of Oregon Inlet that had a special prize for state record catches; cash and merchandise totaling $250,000. Hiebert's response, "I'm not going to moan too much, though. 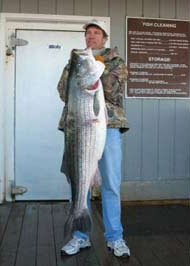 A state record striper is prize enough", shows that although he isn't from North Carolina, he is a true fisherman.